Paula, would you introduce yourself to readers? Hi Lesa, thanks for having me visit your awesome blog! 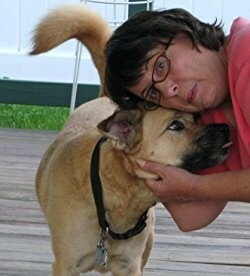 I guess I’ll just offer my official bio: Paula Matter is the author of the Maggie Lewis mysteries which take place in a small town in North Florida. Paula’s short crime fiction stories have been published in USA and German anthologies. After losing her job as a catering server, Paula decided instead of getting yet another job as a waitress/bartender/activities director/etc., she’d tackle her mystery novel again. Last Call is her debut novel. Tell us about Maggie Lewis. Maggie is younger, taller and nicer than I am. Actually, we were the same age when she appeared in another novel I’d written some years ago. My critique group loved Maggie, who was a somewhat minor character. She was funny and feisty. My agent at the time couldn’t sell that book. 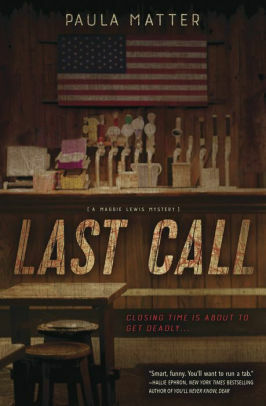 When I came up with the general idea for Last Call, I knew Maggie had to be front and center. Readers of Last Call are saying they like how real she is, and how she develops from being sort of surly and sad to having more control over her life. Tell us about Last Call, without spoilers. The story takes place in North DeSoto, FL (a fictional town based on a few places in Florida I love) where VFW bartender Maggie Lewis is framed for the murder of her least favorite customer. Financially strapped, Maggie's suspended from her job after being questioned for the murder of tattle-tale Korean war veteran Jack Hoffman. She's not taking any chances on the police looking too hard for the real killer. They still haven't solved the last murder in town: Maggie's husband's. Maggie must produce enough evidence to clear her name, get her job back, and find the real killer--or she'll end up behind the wrong bars. What can you tell us about the next Maggie Lewis book? In Last Supper, Maggie will be working as a cook at Sally’s Diner. If you’ve read Last Call, you’ll appreciate the irony. Despite some minor mishaps in the kitchen and money still being tight, Maggie starts to regain her sense of security…until her least favorite customer persnickety spinster Helen Pritchard comes down with food poisoning after eating at Sally’s Diner. When an outbreak of salmonella sickens several patrons, and the Health Department shows up at their door, it becomes clear that someone is out to sabotage Maggie’s boss and close down the diner. With the help of her tenant, newly licensed PI Michael Bradley, Maggie must track down the culprit before he kills more than just the business. Midnight Ink is a well-respected publisher. Tell us about your publishing journey. Everyone’s is different. How did you learn they were going to publish Last Call? My fabulous editor Terri Bischoff rejected it , but with a list of suggested revisions. If I revised and resubmitted, she’d take another look. I revised, sent it back to her. Six months later, Terri emailed me saying she wanted some more info that she could share with the acquisitions team. I responded very professionally with “Wait, what?! You liked it?” Then I sent her what she wanted. A few weeks later, I received a three book contract. What has been the most exciting moment in relation to your book? Oh, what a difficult question to answer! There are so many for different reasons. In no particular order: Hallie Ephron, Lisa Gardner, Lisa Scottoline, S.J. Rozan, Carlene Thompson, Hank Phillippi Ryan, Linwood Barclay are the ones who come immediately to my mind. The suspense, settings, characters are all well written. What author do you think is underappreciated? Annette Dashofy. Her Zoe Chambers books are magnificent. I’m a public librarian, so I always end interviews in the same way. Tell us a story about your experience with a library or a librarian. Oh, I wish I could remember her name. I’ve wanted to contact her over the years to thank her for contributing to my love for reading. She was the librarian at my elementary school. After I had read every single age-appropriate book on the shelves, my teacher took me by the hand and led me to the librarian. She spent so much time with me looking for just the right book. I remember vividly the smile on her face when she pulled the book off the shelf. The book was Strawberry Girl by Lois Lenski. Last Call by Paula Matter. Midnight Ink, 2018. ISBN 9780738757827 (paperback), 288p. Congrats on the new book, Paula! Last Call sounds fabulous. I haven't had a chance to read it yet, Marla, but I'm looking forward to it. I think your book sounds great, Paula. And I love Midnight Ink. Such a great publisher. I always take a look at a book just because they've published it. Congratulations and best wishes! I'll be watching for Last Call. I'm doing a lot of audiobooks lately. Will it be released in audio? Just inquiring. Thanks, Kay! Midnight Ink has been great. Sorry, but I'm not sure about Last Call being released in audio.